Most people watching a movie are simply there for escapism. They want to laugh, connect, and/or be thrilled. But with any hobby there is that small percentage of followers who consider themselves historians and who want to learn everything about that their interest. Naturally, the Blu-ray release of God Told Me To is undoubtedly aimed at that small group of completists who willingly spend time on things that they “should” see. 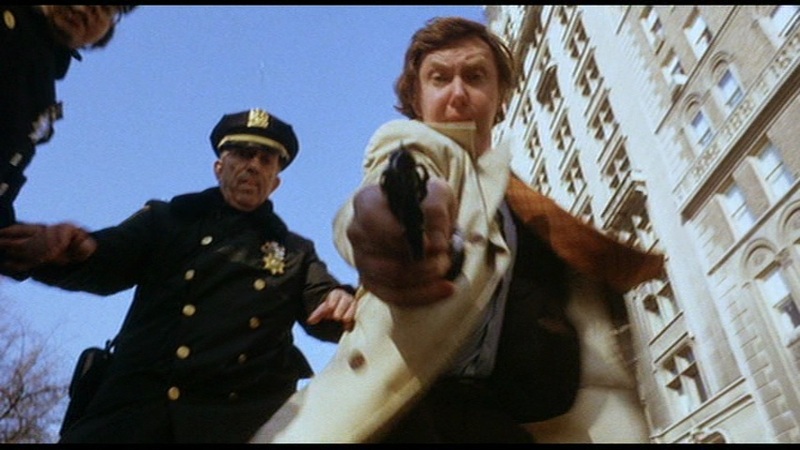 – The film’s writer, director and producer Larry Cohen is a prolific and successful screenwriter. He wrote the screenplay of Phone Booth with Colin Farrell, which was one of Farrell’s first big movies in the United States. Cohen has also had major success within television, writing episodes of NYPD Blue, Columbo and Masters Of Horror. Cohen’s film prior to this was It’s Alive, which has spawned two sequels and a 2008 re-boot with Bijou Phillips. – When video footage of 1970s New York City is shown, it is often related to Studio 54, early hip-hop, the New York Yankees, skyscrapers, or buildings on fire — pure highs and lows. This movie shows a very different Manhattan; working class and colorful, presumably because a lot of the scenes were filmed on the cheap (e.g. people wearing their own clothes) and/or without permits (e.g. you see people staring at cameras in the background in some of the scenes). A lot of the fashion is entertaining unto itself. – God Told Me To was the first movie role of Andy Kaufman. It also predated his role as Latka Gravas on Taxi. Although the packaging mentions Kaufman as one of the film’s stars, he is not listed in the opening credits and speaks fewer than ten words. While a brief appearance, it was interesting to see Kaufman in a traditional movie role. The Blu-ray includes plenty of special features including an audio commentary with Larry Cohen; interviews with star Tony Lo Bianco and special effects artist Steve Neill; two (brief) Q&As with Cohen, theatrical trailers, TV spots, and a gallery of stills. By comparison, the DVD of The Great Outdoors I watched a few days ago didn’t even have a menu. While the film is much funnier than it is intended to be, it ought to be respected for its originality. It is not purely a horror movie, nor purely sci-fi, nor is it a total crime-thriller; the same can be said about most of Cohen’s work. Fans of filmmakers like New Horizon Pictures’ Roger Corman and Troma Studios’ Lloyd Kaufman certainly ought to appreciate what Blue Underground is doing with releases like this. Blue Underground presents God Told Me To. Directed by: Larry Cohen. Starring: Tony Lo Bianco, Deborah Raffin, Sandy Dennis, Sylvia Sidney, Mike Kellin, Richard Lynch, and Andy Kaufman. Written By: Larry Cohen. Running time: 90 minutes. Rating: Not Rated. Released: February 24, 2015.